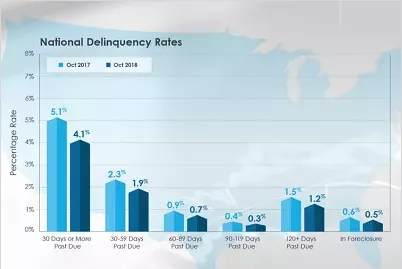 CoreLogic® (NYSE: CLGX), Irvine, today released its monthly Loan Performance Insights Report, which shows that, nationally, 4.1% of mortgages were in some stage of delinquency (30 days or more past due, including those in foreclosure) in October 2018, representing a 1 percentage point decline in the overall delinquency rate compared with October 2017, when it was 5.1%. This was the lowest for the month of October in at least 18 years. As of October 2018, the foreclosure inventory rate – which measures the share of mortgages in some stage of the foreclosure process – was 0.5%, down 0.1 percentage point since October 2017. The October 2018 foreclosure inventory rate tied with the April, May, June, July, August and September rates this year as the lowest for any month since September 2006 and also marked the lowest rate for an October since 2005. In both instances, the foreclosure inventory rate was 0.5%. Measuring early-stage delinquency rates is important for analyzing the health of the mortgage market. The rate for early-stage delinquencies – defined as 30 to 59 days past due – was 1.9% in October 2018, down from 2.3% in October 2017. The share of mortgages that were 60 to 89 days past due in October 2018 was 0.7%, down from 0.9% in October 2017. The serious delinquency rate – defined as 90 days or more past due, including loans in foreclosure – was 1.5% in October 2018, down from 1.9% in October 2017. This serious delinquency rate was the lowest for an October since 2006 when it was 1.5%. It ties August and September 2018 as the lowest for any month since March 2007 when it was also 1.5%. The share of mortgages that transitioned from current to 30 days past due was 0.8% in October 2018, down from 1.1% in October 2017. By comparison, in January 2007, just before the start of the financial crisis, the current-to-30-day transition rate was 1.2%, while it peaked in November 2008 at 2%. Hurricane Irma and Hurricane Florence (2017 and 2018, respectively) continue to impact some metropolitan areas, with mortgages transitioning from current to 30 days past due. 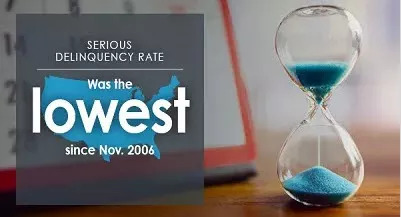 This October, 18 metropolitan areas posted an annual increase in overall delinquency rate, seven of which were either in North or South Carolina. In the coming months, CoreLogic will continue to monitor these and other metros struck by natural disaster for potential increase in delinquencies. “Despite some regional spikes related to hurricane and fire impacted areas, overall delinquency rates are near or at historic lows,” said Frank Martell, president and CEO of CoreLogic.